Horncastle Reserves (red) v Woodhall Spa (blue). Jack Baxter (red), Sam Emerson (blue). 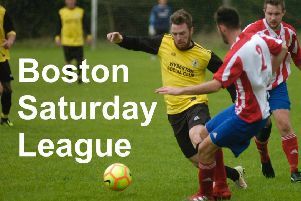 Horncastle Town Reserves secured a derby win on Saturday. They beat rivals Woodhall Spa United 5-2 at The Wong. Horncastle Reserves (red) v Woodhall Spa (blue). Max Gowshall (red), Cameron Robertson (blue). Horncastle Reserves (red) v Woodhall Spa (blue). Dan Nixon (red), Blake Kenneally-Forrester (blue). Horncastle Reserves (red) v Woodhall Spa (blue). Max Baxter (red), Cameron Robertson (blue).